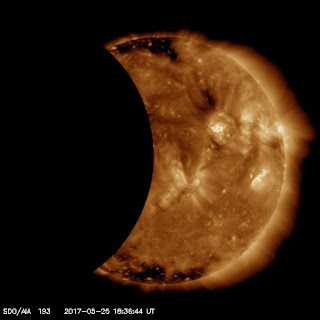 SDO had another visit from the Moon today, as it passed between SDO and Sun. Here are two AIA 193 images showing the Moon moving onto and roughly maximum coverage. Always nice to see another member of the solar system paying a visit. See you again in August! Seven Years of SDO Data! May 1, 2017 is SDO's 7th birthday of data collection. We launched on February 11, 2010, reached our final orbit, checked out the instruments and spacecraft, and began returning science data on My thanks to the SDO Team for their great work on this mission. My congratulations to the SDO Team for winning a NASA Honor Award for Group Achievement! This award reflects the effort and care the SDO Team has put into the mission. We have updated a few things on the SDO Website. The kiosk movies will be turned off on May 31. Please migrate to the SDO Dashboard at https://sdo.gsfc.nasa.gov/data/dashboard/, which has a lot more flexibility in setting up the 48-hour loop movies. As an added attraction, we have added some higher cadence channels (such as the AIA 171 Å channel shown here). 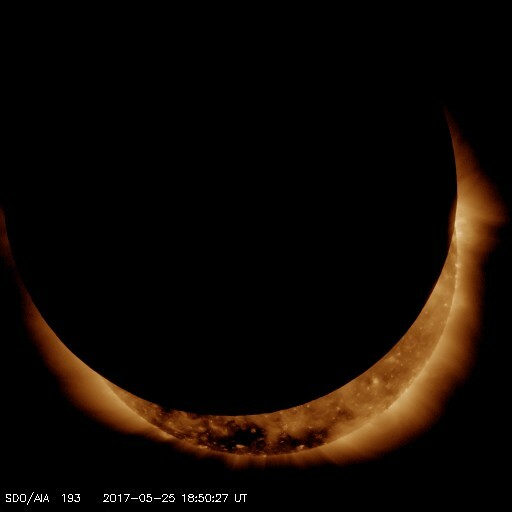 This channel has also been produced with a radial gradient filter that enhances the corona around the edge of the Sun. Update May 3, 2017: Here's an example of how to embed these html5 videos in a website using the high-cadence AIA 171 Å channel.